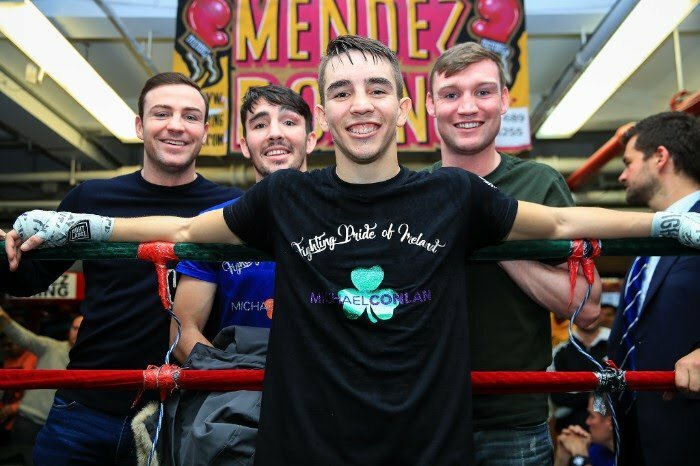 Featherweight prospect Michael Conlan (5-0, 4 KOs) pounded out a one-sided 6 round unanimous decision win against Luis Fernando Molina (7-4-1, 2 KOs) on Saturday night on ESPN at Madison Square Garden in New York. The scores were 60-54, 60-54 and 60-54. The 29-year-old Argentinian Molina didn’t land enough shots for him to have a fighting chance to win any of the rounds. The 5’8″ Conlan looked a lot bigger and taller than Molina. Conlan’s best round of the fight was the 5th. He landed some beautiful uppercuts in the round. Molina showed a good chin in taking the best Conlan could dish out in the fight. In the future, Conlan needs to work on keeping his hands up and throwing more combinations. He fought of the fight with his hands down by his waist. Like Shakur Stevenson, Conlan largely threw single shots the entire fight instead of combinations. The 26-year-old Conlan is going to need to improve for him to catch up to the other talented fighters at super bantamweight like Rey Vargas and Jessie Magdaleno. Those guys are Conlan’s age and they’re already world champions with more solid boxing skills. At featherweight, Oscar Valdez and Joseph Diaz Jr. are Conlan’s age and they looked more developed in terms of their skills.